Making payesh is as good as meditation for me - with a dessert to look forward to at the end of the process. Payesh takes patience and needs attention and concentration, just like I imagine meditation does. The process is simple but it's slow and it takes time. And practice. Just like meditation. And I find it calming and steadying, just like meditation is supposed to be. So I make payesh more often than I meditate. My last visit to Kolkata threw up many new ingredients as I wandered markets and melas whenever I had the chance. Among the myriad things I saw was Chushi or Choshi Pithe - small rice shaped dumplings made with either white flour or rice - used in payesh. It reminded me of 'ghavlye', a similar dumpling made in Maharashtrian households and also used in kheer. Payesh and kheer are both desserts made by reducing milk till half and then adding flavours, sweetness, and a thickener in the form of either rice, vermicelli, and occasionally these rice-like tiny dumplings. Similar dumplings are made among many communities across the country. Chushi pithe are extremely laborious to make and as a result not many women make them any more. Who has the time?! Fortunately there are enough enterprising women from villages and small towns who are happy to make these labour-intensive products and bring them to the big cities for sale. I bought several packets and once back home in Kharghar I made Chushi Pithe'r Payesh at the first chance. The lady who sold me the pithe gave me very simple instructions. Fry the pithe in ghee till it's a nice golden brown and keep aside. Make payesh as you normally do adding the pithe to the reducing milk so it cooks properly. That's all. In a thick bottomed vessel bring the milk to a boil and then simmer over medium heat to reduce it to half. Put in the cardamom pods and the tej patta while the milk is reducing. Remember to pop open the cardamom pods. In a small pan heat some ghee. Use good quality ghee and not vanaspati. 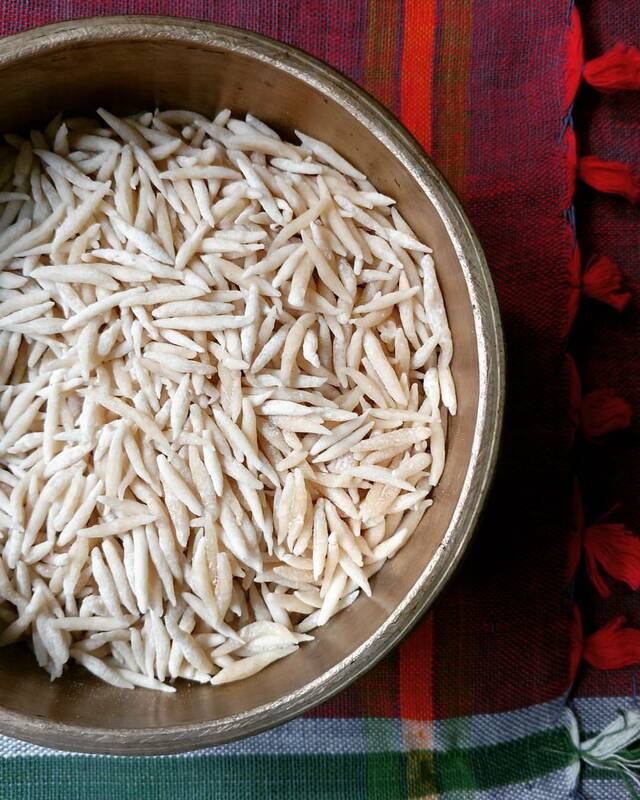 Once the ghee is hot fry the chushi pithe till the grains turn a light golden brown. This takes just 10 to 15 seconds so keep an eye on it while frying. Do it in batches if necessary. Drain off the ghee and keep the fried pithe aside. In the same ghee fry the raisins and keep aside. Once the milk has come to a boil add the fried pithe to the milk so it cooks while the milk reduces. Stir gently to ensure the pithe doesn't stick and form clumps. Let the milk simmer gently and reduce till at least half. The colour will change to a light pinkish brown. Check that the pithe is cooked through and isn't hard in the centre. Add the sugar and stir nicely to combine. Add the fried raisins too keeping aside a few for garnishing later. Let the payesh cook for another 10 minutes or so till it is as thick as you like it. Remember payesh will thicken as it cools so don't reduce the milk too much or you will end up with a solid pudding. 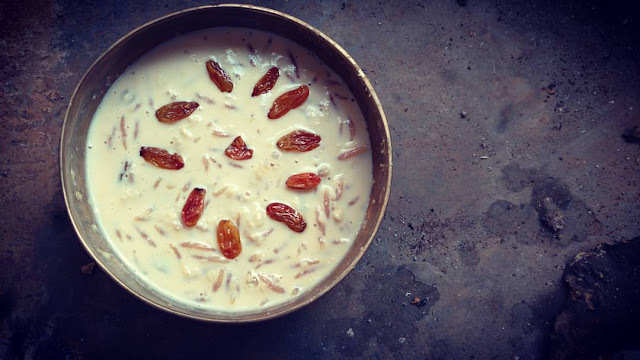 Remove the payesh to a serving bowl and garnish with the remaining fried raisins. You can also add lightly fried cashew nuts or almond slivers to the garnish. From where did u buy the chusi pithe in kolkata?? Would love to buy n prepare the payesh too..
@Deepashree I got them at the Saras Mela at Salt Lake.